NBC Charlotte (WCNC) is partnering with Discovery Place to host a meetup on Thursday, July 25, 6 p.m. to 8:30 p.m. at the science museum in Uptown (301 N. Tryon St.). Here's how the event is being described by the organizers: "You can rub shoulders with NBC Charlotte’s own, grab some face time with your Twitter friends, snag a cocktail at the cash bar, play some games, win some prizes, engage in some science fun or jump in the photo booth for some silliness at Discovery Place..."
Admission to the meetup is free, but registration is required by visiting nbccharlotte.eventbrite.com. Capacity for the event is 500, and so far nearly 350 people have registered. The hashtag being used for the event is #WCNCmeetup (Twitter | Facebook | Instagram). 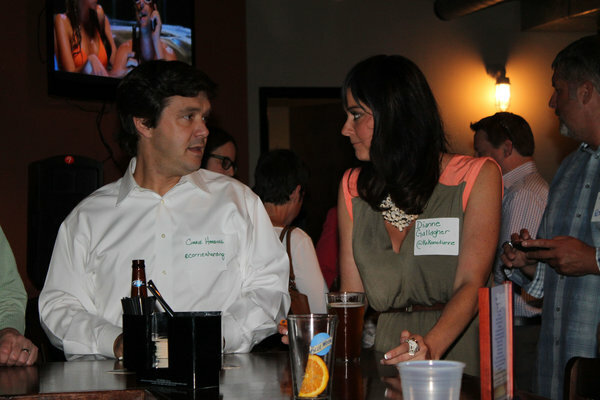 NBC Charlotte's Dianne Gallagher chats with a guest at last year's WCNC Tweetup. WCNC hosted a similar event last year at Icehouse South End, which I had the pleasure of attending, and I made several new connections. I think these types of events are a great idea. Most of us use social media these days, and we often "follow" or "friend" people on these sites whom we don't know personally or have never met in person. But because of your interaction with their tweets, status updates, and photo sharing, you feel as if you know them. So an event like what NBC Charlotte and Discovery Place are doing gives you the opportunity to continue your social networking--literally--but step beyond the virtual world. I always encourage people to get out and network, no matter your profession or interests (remember, you can frequently find Charlotte networking events listed on my Dusk Till Dawn blog). As much as I rely on the Internet and social media, it'll never be a substitute for building actual one-on-one, face-to-face relationships. That was a part of the reasoning behind the "Charlotte’s Web: A Celebration of CLT Bloggers & Digital Tastemakers" event I put on in May.